PARIS, 17 March 1999 - Born on Saint Patrick's day 1938, Rudolf Nureyev would have celebrated his sixty first birthday today. It would be hard to find a greater tribute to his immense talent and the heritage he left behind him than the superlative performance of The Bayadere, on January 6th (anniversary of his death), at the Opera Bastille. Elisabeth Platel's interpretation of Nikiya the temple dancer, passionate, intense and yearning from the moment she appeared on stage touched perfection; Agnes Letestu, as the proud and beautiful Princess Gamzatti, the role Nureyev gave her when she was only a member of the corps de ballet, was dramatically and technically brilliant, while Nicolas Le Riche as Solor, the Indian warrior unable to choose between the two of them, gave a heart-stopping performance. When I first saw The Bayadere in October 1992, it was a magnificent production, full of Russian soul and Russian excess; a melodrama rendered more moving by the fact that it was obviously Nureyev's last ballet, despite the fact he had already begun working on The Prince of the Pagodas. It was the perfect vehicle to demonstrate the astonishing and diversified talent of the company he had made the best in the world since his appointment as artistic director almost ten years before. The unfolding of Nureyev's version, which closely follows that of the Kirov, ends when the despairing Solor resorts to opium and is transported to another world where he joins Nikiya in one of the most famous "white acts" in the history of classical dance. "Fortunately", he continued, "there are the etoiles who worked with Rudolf - Laurent Hilaire, Elisabeth Platel, Isabelle Guerin, Manuel Legris, and Florence Clerc and Ghislaine Thesmar who knew his way of working well, and are now teaching here. We are guarding our heritage preciously but it's a constant battle to keep the energy, rigour and "look" that Nureyev gave us. "I try to do as Rudolf did", said the ballet master, "He used to watch the very last member of the corps de ballet who would do anything for him. I tell them that they are all the danseuse etoile; all Nikiyas descending from the heights of the Himalayas, all bayaderes, pure, limpid, luminous. I tell them to breathe the music, and be proud, strong and moving, reminding them constantly they are individuals, not an army of robots." Which is where Rudolf Nureyev's own story with The Bayadere began. He repeatedly asked Dame Ninette de Valois to present the complete work in London, but after Natalia Makarova's version (re-mounted for American Ballet Theatre in 1980) was programmed there in 1989, in honour of Margot Fonteyn's 70th birthday, history came full circle when his more opulent, more authentic staging became the property of the Paris Opera Ballet instead. Mario Bois (Musical Editions Mario Bois), described the day in 1989 when Rudolf Nureyev arrived in his office announcing his intention to re-stage The Bayadere using the complete original score of Ludwig Minkus, the official ballet composer of both the Bolshoi and Kirov companies. How sad then, that the Orchestre de l'Opera National de Paris, directed by Vello Pahn, couldn't have shown a little of that respect not only to Minkus, but also to Nureyev, Lanchbery, and the exceptional dancers of the Paris Opera Ballet. On one of the evenings I was there, it was rumoured that the troupe had been hit by sickness and injury, but this was not evident. It was the motley collection of musicians in the orchestra pit who were ravaged by some vicious form of sleeping sickness, not that it prevented a smirking group from playing "footsie" during the overture. On another occasion, some were singing. And as far as their playing was concerned, at times they were barely audible, so much so, that it was reported that Isabelle Guerin (who created the role of Nikiya in 1992), threatened to leave because she couldn't hear the music. As long ago as 1838, Theophile Gautier wrote that the very word "bayadere" evoked "sunshine, perfume, and beauty. His article spoke of the "dreams in the form of shuttered pagodas, idols of jade, and jewelled elephants with howdahs on their backs", as in Petipa's ballet. And no one has re-staged Petipa's works quite like Rudolf Nureyev. His elephant is blue and gold, turquoise, silver and white, the very colours of the Kirov Theatre. 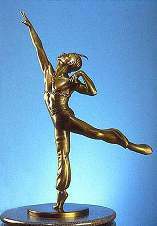 It is a wondrous creature which fires the imagination as does this last, great reconstruction of Rudolf Nureyev. Life and dance of the great Russian gay performer Rudolf Nureyev. Our selection of books about Nureyev that you can purchase on-line. Was Rudolf Nureyev a Soviet spy? FBI opens its files. Did AZT contribute to Nureyev's untimely death? 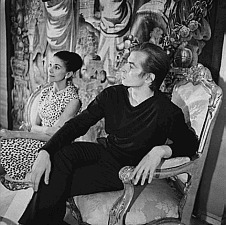 Article to the 60th anniversary of Rudolf Nureyev.